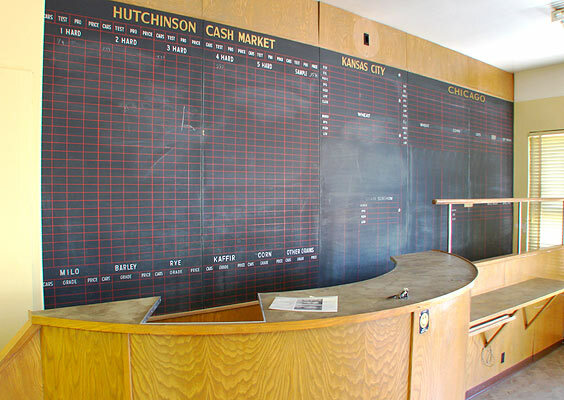 There is a dearth of photos on the net showing the Wiley building interior (and for that matter, the insides of most downtown buildings in Anywhere, USA). As photographers, as bloggers, as people concerned about preservation, we need to remedy this no matter where we may live. This is one of my humble attempts. I urge you to go out into your community and document something. You'll feel good for it. I promise. The areas I'm showing have been abandoned for some time, hence, their almost archaeological charm. See A Brief History of the Wiley Building for more information. 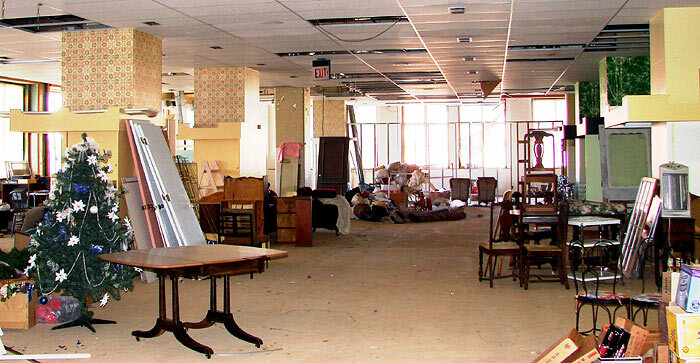 Second Floor - apparel...well, not anymore. You won't find much to wear on the second floor of the Wiley building these days, and none of that stuff in the picture is from there. The second floor is used as storage by the building manager. 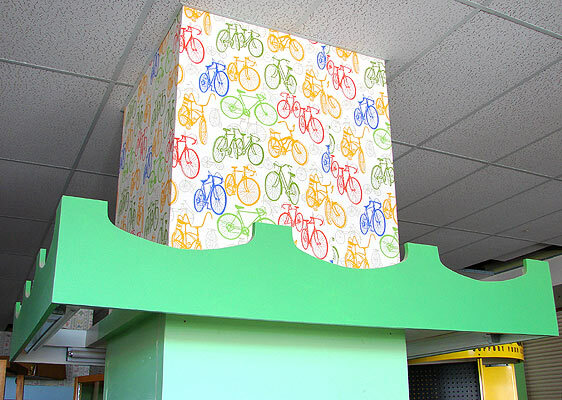 There is an assortment of wallpaper still in place. Maybe this area was last used for showing exercise clothes? This is the only one of the eight floors that is open and cavernous. All of the others are divided into offices. On the other side of the large, square door in the distance is a bridge between the Wiley and the Fox Theatre. 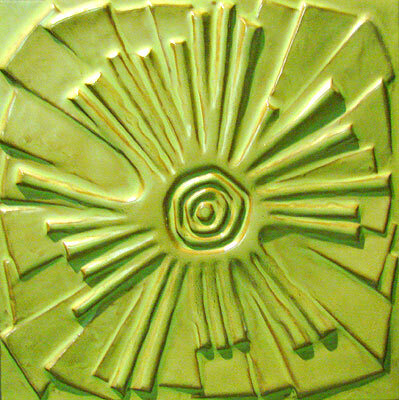 Carved wheat panels decorate the reception desk at the Collingwood Grain office on the 3rd floor. The 3rd and 4th floors extend over the Fox Theatre. 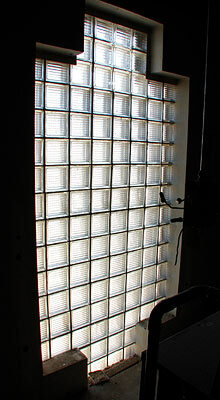 This glass brick window is on the 4th floor. 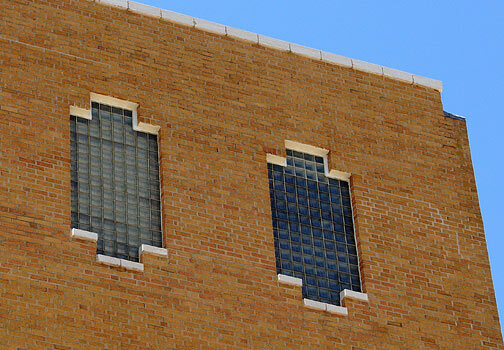 Here is the same window, seen from the outside on the east side of the Fox Theatre. It's the one on the right. 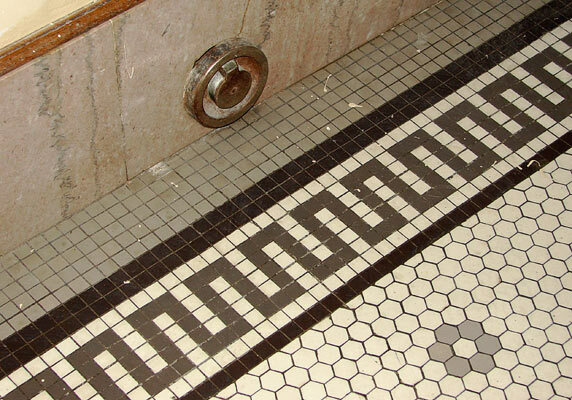 Original floor tiles like these decorate much of the building. These are on the 5th floor. 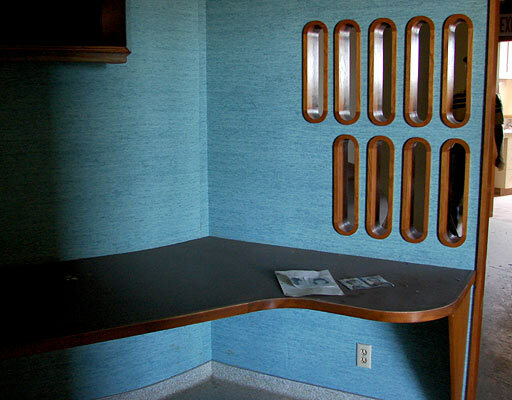 A middle 20th century feel dominates the abandoned dental office of B. R. Dryden, D.D.S., on the 6th floor. 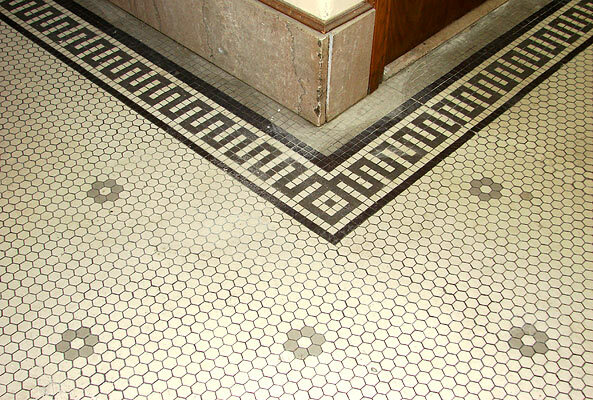 Ceramic tiles surround the doorway of a law office on the 6th floor. The round outlet was part of a building-wide vacuum cleaner system. This one is on the 7th floor. There is more woodwork in place on the upper floors. 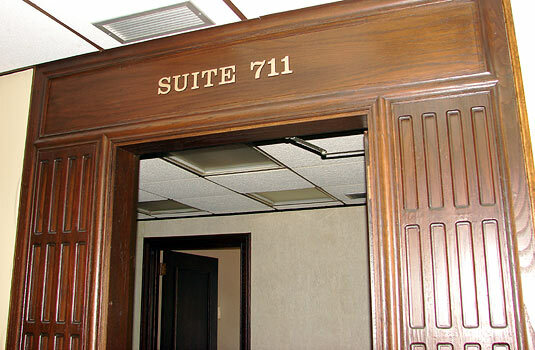 This oak doorway is on the 7th floor. Let's take an elevator ride from the ground floor to the 8th. The roof hatch is conveniently not in place. Silence rules the 8th floor where wheat was once traded. 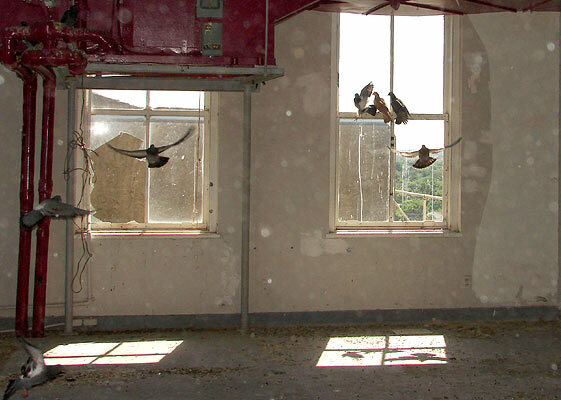 Though almost all broken windows have been replaced throughout the building, pigeons flutter about the penthouse, which still has some. It turns out that pigeons are not as smart as I thought - they kept banging into windows and missing obvious broken panes that offered escape. 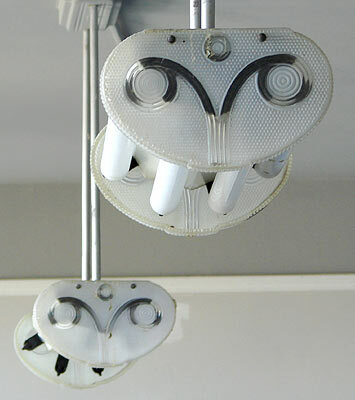 Light fixtures hang from the penthouse ceiling. The roof of the Wiley affords a different view of the Hutchinson skyline. Mercury Redstone and Gemini Titan II rockets jut from the treeline, as do the Kansas Cosmosphere, the Hutchinson Community College stadium and a grain elevator that I seem to be photographing quite a bit of late. Magnificent old building. Enjoyed the elevator ride. Ace should come to the Augusta Historical theater. I has just been restored. The theater is aa voluteer community movie house. Our little town is very proud of it. I would love to give you a personal tour. You know where to find canyaz...Augusta, KS! Canyaz, I'll take you up in that offer. This is indeed a case of syncronycity. Tonight I was at a concert in Wichita and mentioned wanting to see inside your theatre while chatting with a lady from Augusta. It would seem I'm really supposed to go there. You might also enjoy this bit on the Coleman Theatre: http://www.thelope.com/2006/05/serendipity-at-coleman-theatre-on.html?